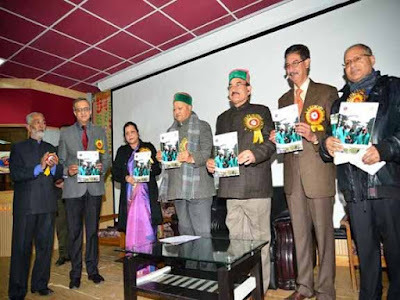 Shimla : Himachal Pradesh Chief Minister, Virbhadra Singh said that Indira Gandhi Medical College (IGMC) had become a beacon of light to other health institution of the State. He said it was the only State Government institution in the North India providing open heart surgery facility and running super speciality M CH programme and DM Cardiology courses. To keep pace with the advancement of medical services in the field of cardiology, the State Government would provide latest equipments, machinery, ICU beds and more operation theatres to facilitate the patients. He was speaking during the function organized as a part of celebration on 10th anniversary of Cardiothoracic & Vascular Surgery (CTVS) Department of IGMC, Shimla, today. He said IGMC was celebrating its Golden Jubilee this year and it was coincidence that Cardiac Surgery Centre had also completed ten years of its functioning during this year. He congratulated the entire team of the CTVS Department for its remarkable achievements during last ten years especially for performing over 1600 open heart surgeries with a noteworthy success rate of 98 percent. The Chief Minister said the Cardiac Surgery Centre was opened during the regime of Congress Government in November, 2005 with a view to benefit the patients of the State, especially the poor patients who were not able to bear the cost of heart surgery in private hospitals outside the state. The doctors, nurses and other Para-medical staff from IGMC underwent three-months training at AIIMS to perform open heart surgery. The Centre had been further strengthened and it was providing the facility of Open Heart Surgeries including CABG, Valve replacement and surgery for Congenital Heart diseases. Virbhadra Singh said majority of the patients had been provided financial assistance from the Chief Minister's Relief Fund to undergo open heart surgery. He expressed happiness that with the introduction of Rashtriya Swasthya Beema Yojna and School Health Programme, more and more patients were availing this facility. The Chief Minister said the State Government had always accorded topmost priority to the health sector so that people of the State could avail best health care services within the State. “As far as the health sector is concerned, I have never compromised in providing funds as we need to keep in pace with the latest advancements and techniques especially in premier health institute like IGMC to provide best health care facility besides maintaining standards of medication and surgery” said the Chief Minister. Chief Minister Virbhadra Singh also released a souvenir on the occasion.